ULTIMATE JDM: You think your pallets are cool? 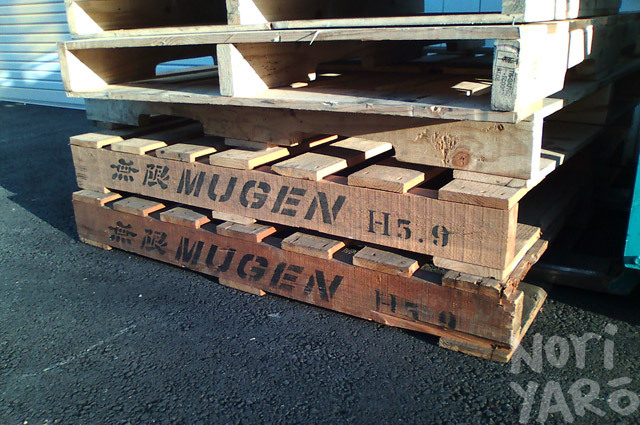 You’ve got nothing on a Mugen pallet. Yes, this is a bit of a half-arsed post, but I’ve been flat-out since last Friday ferrying the boys from Auto Salon magazine around to various workshops around Tokyo and far, far beyond. Unfortunately, since they’re paying me for it, I can’t go ahead and show pics of the cars, since that would be unprofessional. I can show you cool little things I find on the way and take photos of with my mobile phone though. I also just wanted to put this photo up before mag photographer Mark Pakula does. Ha, I beat you. Nyah. More actual photos taken with a camera and not a phone coming soon. so the photos that they don’t choose to use are you going to upload those? For overnight parts from japan, of course.